When we think about guided optics or photonics, we usually think about two methods of guiding light: fiber optics and integrated optics. If you aren’t very familiar with guided light, here is a great introduction to get you started. Fiber optics has long been an important technology for telecommunications, and integrated optics has recently become an intense topic of research due to its promise of guiding light on silicon chips alongside microelectronics for purposes of increasing bandwidth, among other applications. But what about the interface between these two platforms? An overhead view of two gratings. Each grating is connected to a waveguide via a taper. A device like this is used to measure the coupling efficiency (but remember to account for the fact that the coupling happens twice here). The gratings pictured here are about 30 microns long, but can be made shorter. 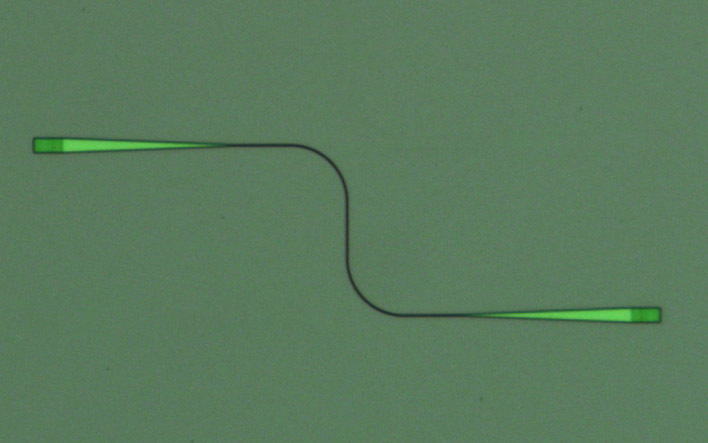 Though perhaps less glamorous than other topics in integrated photonics, coupling between fibers and chips is still a critical step in most research and many applications. The laser light that comes out of a tunable laser is guided by fiber, so how do we get it onto a tiny chip? 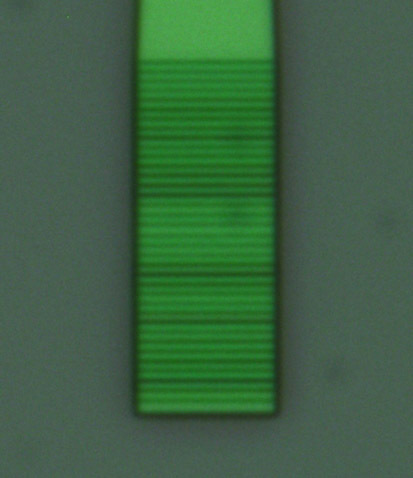 The waveguides on a chip are only a fraction of a micron in dimension, usually only several hundred nanometers. To give you some perspective, a human hair is hundreds of times larger than these little guys. But isn’t a fiber also pretty thin? They are 125 microns in diameter once the plastic coating is removed, on par with a human hair, but the core is only about 10 microns. Coupling light from a fiber onto a waveguide is like shining a flashlight at a pinhole – a little gets through, but most of it is lost because of the big mismatch. One way to solve this is to actually taper the waveguide down to a smaller tip and align the fiber to it end-to-end. Wait, why are we making it smaller? Isn’t the problem that the waveguide is too small compared to the fiber? Yes, but it turns out that the fundamental mode of a very thin waveguide is guided so gently by the high-index core that the mode spreads out, and so much of the light is actually in the cladding around the waveguide that the mode size approximately matches that of the fiber! This leads to very efficient coupling between fiber and chip, and so this method is commonly used. Does that mean that the problem is solved? Not quite. There are a lot of downsides to this inverse taper method. First, the method is very sensitive to everything being aligned perfectly. Also, the taper needs to be right at the edge of the chip. That means that, first, you can’t couple light into the middle of the chip (or out), and second, you have to cut and polish the chip at the edge so that the taper is properly at the edge. This is all a lot of trouble, and if you are testing a lot of chips, you have to do this for each one. Wouldn’t it be easier if you could just point the fiber at the chip and it automatically couples light in? An close-up view of a fabricated grating, with notches composed of a thin layer of silicon surrounded by SiO2 cladding. Grating couplers aim to do just that. A grating is essentially a set of grooves (or notches or teeth) in the waveguide. Light incident on the grating from above (if the fiber is placed directly above the grating) ends up coupling into the waveguide. How does this work? You may be familiar with diffraction gratings which look like little sheets of plastic. You can shine a laser at them, and the beam splits into a few discrete other beams heading off at various angles. The sheet has many tiny slits in a periodic pattern, and if you are familiar with the wave nature of light (or read more here) then you can predict the angle of the various beams coming out. The grating couplers on chips work in a similar way. Light coming from the waveguide diffracts upwards towards a fiber, and light from the fiber diffracts into the waveguide. The position of the fiber isn’t nearly as critical as it was for the inverse taper method, so this allows quick coupling on and off of the chip. Even better, the grating can be patterned and etched during the fabrication process alongside the existing waveguides, so no extra steps are needed. This all sounds great, but there is a downside. The coupling is usually not as efficient. You won’t get 100% or 90% efficiency between fiber and chip, but recent research has bumped up expected values from less than 30% to upwards of 80% in some cases. Like most of engineering, there are many tradeoffs here. You can sacrifice some efficiency for simpler fabrication, or you can use a gold bottom reflector and ten-step fabrication processes with complex materials (and maybe even a Blu-ray drive just to be safe) and then reach a higher efficiency. It depends on your specific constraints. There’s a lot of great work out there already, and yet there is still a lot of room for improvement. At the Cornell Nanophotonics Group, we have investigated methods to increase the coupling efficiency while keeping the fabrication and preparation process simple. One method to achieve this involves optimizing the grating pattern. Rather than a periodic, predictable pattern of grooves, the size of each individual groove and gap can be optimized to increase the efficiency. Also, a large amount of light is lost to the chip substrate, completely bypassing the grating. If the design is optimized properly, then a portion of this light can be recovered without complicating anything else. This should hopefully make you aware of some of the design challenges in making integrated optics a more mature technology. Brian is currently researching ways to improve integrated photonics systems and developing new on-chip technologies. This entry was posted in Research and tagged Cornell, fiber optics, nanophotonics, optics, photonics, research. Bookmark the permalink.